You may be looking to add more trees to your backyard yet don’t know what to select. Perhaps you are scared of creating a forest as trees tend to grow, and grow, and grow. Maybe you just want some little accent to a deck area or around a pool. Nevertheless, you should look at a few things before planting a tree in your garden. To start with, make sure you do your research to determine how large the tree will become. Listed here are a few small trees that you may want to grow in your garden. Maples are members of the Acer (Aceraceae) family, a Latin word which means sharp, in reference to the tree’s leaves. Maples include both shrubs and trees which can grow up to 150 feet tall. The Paperbark Maple could mature to 30 feet tall with a spread of up to 15 feet. The name “paperbark” refers to the trees paper-like bark. It’s a cinnamon brown with a peeling look. The tree’s foliage is 3-5 inches wide. The leaves are green in the summer and are a mix of reds, yellow and orange in the fall. The Paperback Maple grows best in full sun or partial shade. Ah, the Japanese Maple. So what can we say on this beautiful tree? It’s elegant, it’s colorful and it’s a fantastic add-on to any yard. It even is available in different types like weeping and upright so it may go almost anywhere. It is just a great small shade tree and at it’s most mature it won’t grow more than 30 feet tall and wide, as well as the pretty leaves! Such pretty leaves. The Japanese Maple does best in zones 5-8. Two other trees that happen to be popular are the snow gum and also the Tibetan cherry. The snow gum tree is a year-round tree that’s got grey, cream, and green bark. The evergreen leaves are a grey-green color and has small white flowers in the summer. It grows up to 8 meters and prefers full-sun. The Tibetan cherry can be another great year-round tree. It features a red bark and flowers white in the spring and has red-yellow leaves in the fall. This tree grows 10 meters high so both of these are on the larger side. The Fringe tree obtains its name from the tons of white fleecy looking flowers which it produces each spring. It looks like a fringe with its dangling offering and definitely, like with many species, there are many different varieties available. 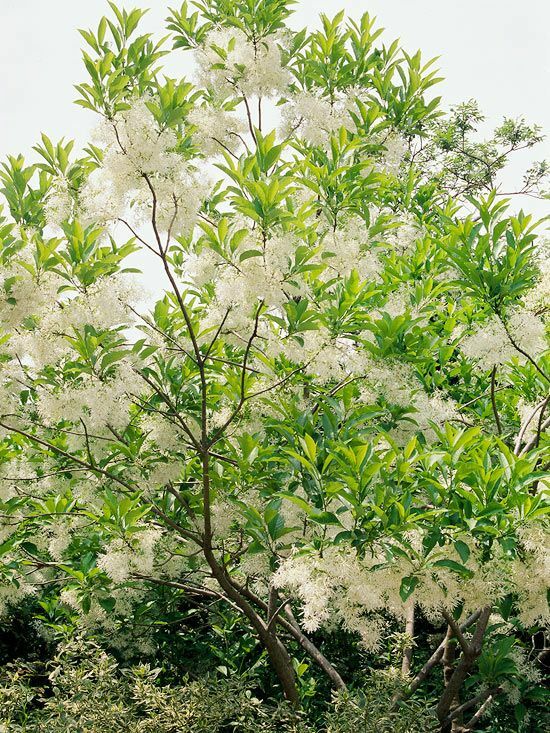 The fringe tree can tolerate a great deal of soils and is perfect for yards in zones 4-9 based on the variety you decide on.